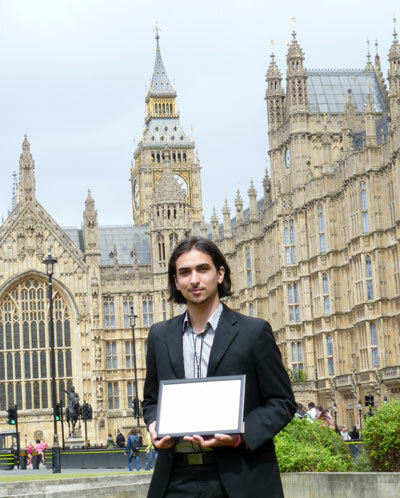 Lord Laird presented Matteo Bergamini with a 'Peace Award' in Committee Room 14 at the Houses of Parliament during the Universal Peace Federation's Annual Award Ceremony on 1 July 2014. Matteo started Shout Out in July 2012. It has become one of Britain's fastest-growing alternative and independent news media platforms with the aim of opening young people's minds by showing them the power they hold. Matteo says, "We believe political apathy comes from society-induced ignorance. Young people are not being told why politics is important or how to get involved in the political process. Society expects all of us to get enlightened as soon as we hit 18. It doesn't work that way. If you haven't been told how the system works or why it is important to get yourself involved in it, then young people simply won't do it." "Our Mission is to report on issues and news stories otherwise ignored by traditional media, to lift political awareness and to bring worldwide news stories to young people in the UK." "I am delighted that some of our young people will be attending the FIC's "Politics - what's the point?" discussion in the House of Lords during Parliament Week this November. We hope that this will be just the start of our work with the Foundation to help raise awareness of the importance of politics and encourage young people to get involved." "I am inspired by Matteo's work and his idea for Shout Out," commented Lord Laird. "He and his colleagues have a huge amount of energy and dedication to their objectives and are to be praised for the work they are doing, helping to raise awareness of the importance of politics to young people. Getting young people engaged in all aspects of society is critical and we all need to learn how to communicate effectively between the generations." "Young people cannot be expected to find out about politics and get engaged in society if we don't help and ecnourage them. Of course, it is a two-way street, but we should take the lead here in Parliament. It is our job. The benefits are so vital to the future of the country and the world. It affects everything from education, through employment to the effective functioning of society itself. We are deligthed to be collaborating with Matteo and I congratulate him yet again for winning the UPF Peace Award which clearly recognises the importance of his work with regard to peace and reconciliation." Other inspiring Award recipients can be seen on the United Peace Federation's web site.